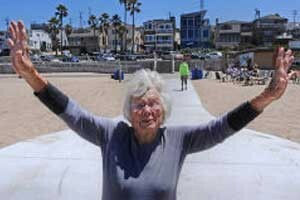 Evelyn Frey stood at the end of a concrete walkway in the middle of the beach at 42nd Street in Manhattan Beach, looked out at the ocean and threw her arms in the air. To the passers-by down at the beach this week, Frey was simply standing on a 70-foot-long slab of concrete. Convenient yes, if carrying armfuls of beach gear or pushing a stroller, but not very extraordinary. But for Frey, a spry 98-year-old, that pathway gave her back something she had missed for nearly a decade — a chance to be closer to the water. This week’s completion of the Pathway to the Sea by city workers was the culmination of a years-long crusade by Frey to get the disabled down to the shore. Several years ago, the longtime Manhattan Beach resident walked down to the ocean she lives two blocks from, but as she plodded back up, she suddenly couldn’t lift a foot. She later discovered it was the beginning of a heart problem, and she would no longer be able to trudge through the sand. Thus began her mission to find a way to provide beach access for the “less physically abled” — older adults, people in wheelchairs or scooters, even parents hauling a bulky stroller. Although she drummed up support from hundreds in the South Bay, including Los Angeles County Supervisor Don Knabe and the Manhattan Beach City Council, she continuously hit bureaucratic snags. The county, which owns the city’s beach, brushed off her initial recommendation to install a portable rollout walkway like a Mobi Mat, citing liability and operational concerns, and city staff in 2011 urged the City Council not to approve a walkway because of the cost and distance from the water. At one point, Frey contemplated giving up. “Someone told me I had so many loaded guns in front of me, I didn’t really have a chance,” she said. Finally, after dozens of trips to city and county offices and passionate pleas to City Council members, Frey got her wish. The City Council in 2012 approved the installation of a concrete walkway at 42nd Street. After another lengthy wait as the city secured the proper county permits for construction, the pathway is finally open for use. The $25,000 walkway, which is 10 feet wide by 70 feet long and 150 feet from the water line, is located just below the handicap-accessible ramp from the El Porto parking lot down to the beach at 42nd Street. Frey said she hopes the city will arrange a bus to take the older adults who hang out at the Joslyn Community Center down to the water. As she stood on the walkway, watching the surfers zig and zag through the white caps, a man walked up and suggested someone install a portable mat so people can make it all the way down to the water. “I worked on that for years, and I failed,” she said. Frey said people have asked her what she’ll do with all of her time now.